The Media Desk is located in the basement of the Main Library on the North Campus of the University of Georgia. It is part of the Access Services Department of the UGA Libraries. 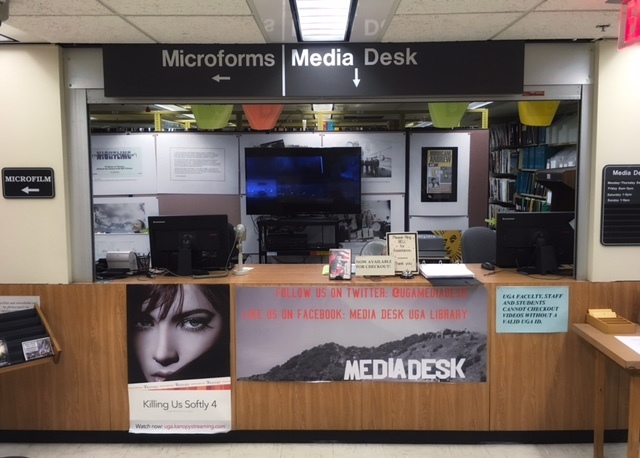 The Media Desk holds the Libraries’ collection of commercially distributed motion pictures, television and radio programs. This collection supports the research and teaching activities of the University's faculty and students. One of the services we provide to the teaching faculty and staff is to provide access to reserve materials for courses. Music CDs are located in the Music Research Library. Would you like to suggest a new audio or visual item, or a new book for the Libraries' collections?